Thomas Jones, a junior from Laurens High School in Laurens, South Carolina is a two-sport star, playing the outfield in baseball and one of top safeties in the country on the football field. 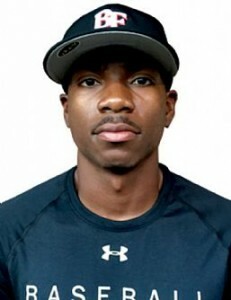 The 6’3″, 195 Jones showed great athleticism on the baseball field at this year’s Under Armour All-America Game, leading off for the America Team and playing left field. Jones finished the day 1-for-4 with a run scored. This season at Laurens, Jones hit .495 with five home runs and as a defensive back, had four interceptions for his football team. Baseball Factory caught up with Jones to talk about the All-America Game and much more. 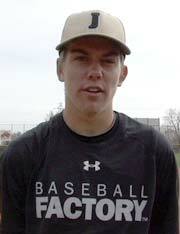 Baseball Factory: Was that your first time being in Chicago? Thomas Jones: It was my first time. BF: Was it your first time flying? TJ: This is my second time… actually, you can say my first time being by myself. Its been over like, eight years since I’ve flown.. to me, this is my first time. I had a red eye and slept the entire way. BF: How exciting was it to be named an Under Armour All-American? TJ: Just telling people back home, they were like, “oh man!” Not many people get that experience, only a few people in America have that honor.. It was an awesome experience for me getting called that day and being told that you’re going to come to Chicago and play at Wrigley Field. A lot of people don’t get that opportunity at my age, so it was awesome. BF: You’re also a defensive back for your high school at Laurens in South Carolina… what do you like the most about being a defensive back? TJ: I like catching wide receivers coming across the middle, that’s the best thing about it. Going after deep passes too. BF: What gets you more amped up: hitting the game-winning homerun or making a game saving tackle or pick-six to win a game? TJ: Game-winning homerun, hands down. With football, a baseball player can play football any day, but a football player can’t play baseball. So hitting a 90 mph pitch or higher, most people can’t do that. So hitting a game-winning homerun to put your team ahead, anyone would want to do that. BF: What position do you like playing best in baseball and why? TJ: Definitely outfield, mostly centerfield because you see the entire field. You have the best angle and see the baseball the best. BF: Who do you model your game after? TJ: Adam Jones of the Baltimore Orioles. I like his body type, love his swing, how he plays the game. He always plays the game hard. BF: What’s one thing most people wouldn’t know about you, but will once they read this? TJ: I would say… I’m a big guy on laid-back music. I don’t like hype music all the time, I like real chill music. I would say singing.. I’m kinda down with that. I’m not really down on getting crunk like that. I like being relaxed. BF: Favorite hobbies that you like to do away from the baseball or football field? TJ: I would say play video games. Or sleep. Both are pretty good. BF: Sum up your All-America experience. TJ: It was an awesome experience. If I could do it all over again I would. It was great to play with and against some of the best baseball players in the world.